If you're a regular visitor to this blog, I must apologise for the lack of any postings over the last couple of weeks as we've been away to England to see family and friends, having spent Christmas here in Brittany. 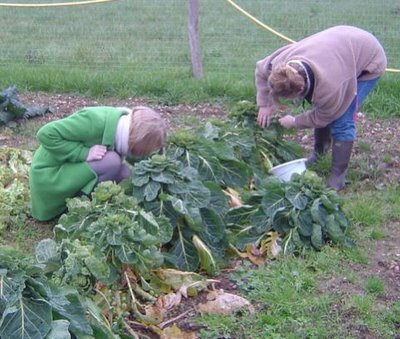 The photo above is of Gabrielle and her daughter Christina (who joined us for Christmas) raiding our neighbours vegetable patch for some Brussels sprouts. Looking back over the blog, whilst I've spoken lots about our chickens and geese recently, it's been some time since I wrote anything about the vegetable side of our diet. It doesn't seem the season, yet Alan and Carol have a couple of rows of the sprouts and some very tasty leeks. We hope to grow a lot more fruit and veg this year but, with the wind howling around outside and the clay soil heavy with rain, there doesn't seem much to do practically other than read books on how to grow them and plan. In future blogs, I'll tell you about the permaculture planning process for the woodland and the gite garden. We've finished the design proposal for the garden and started work, and I've translated our management proposal for the woodland into French and it's currently with our young friend Marine to check before I email it to the two French expert forestiers in two different agencies to canvas their views before I get the chainsaw out. We've still a way to go with the design for the whole site, which we need to firm up soon so I can get some fencing done. I shall also be telling you about some other great blogs I've come across. I get to check them first, so there will be a delay before your comments appear. And I've added another complication called word verification to avoid "comment spam". All you have to do is copy the squiggly word in a box, apparently a step to far for the automatic programs that generate the annoying spam! Nice to see you are settling well in Brittany. My wife Sally and I have just bought a house in Anjou, North of Saumur and everything going well we should move in by the ned of this year. Your site is of great interest to me as I intend to follow permaculture principles although we only have about a quarter of an acre. I am French although I left a long time ago so I am coming back home really. Anyway just to let you know that I keep an eye on your activities so as to have an idea of what is in store for us. Bonne Année to you too and thanks for dropping by and leaving a comment. Bon chance with your house move; does it need work doing to it first? I think you'll find loads of things you can pack into a quarter of an acre, most of the permaculture books I've read warn against the dangers of NOT starting small. 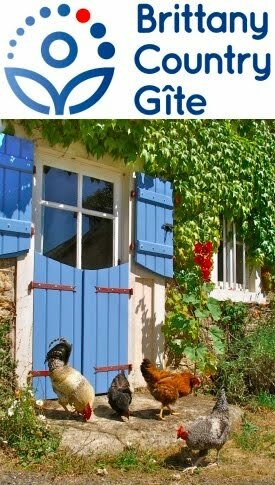 I don't know how well known permaculture is in France, perhaps you can tell us? Over the next few blogs, I'll be writing about the planning process as we're finally ready to start work on the gite garden and the woodland. We look forward to reading your own blog once you've moved in!